The 426 HEMI is one of the best engines around. It’s made already-good cars spectacular. It also sounds splendid. The level of aural trauma one receives just listening to this car is incredible, but it’s well worth ear surgery! It also is one of the best-looking engines out there. One can argue that the best Dodge to come with the 426 HEMI (or the Elephant Motor) was the 1969 Dodge Daytona. It was built to rule NASCAR. It did. In fact, it did so well that NASCAR banned aero cars after the Daytona and it’s sister car, the Plymouth Superbird, dominated NASCAR in the 1969 and 1970 seasons. However, I think that a second-best Dodge is the Challenger R/T with the 426 Street HEMI. Yes, they had to have a street tune for this engine! That should give you an idea of how good this motor is. The Challenger R/T is relatively rare, powerful, and really represents the muscle car craze of the 1960s and early 1970s. The new Challenger is a throwback to the original. Dodge made the original Challenger to be something that you could pack the family into and drive on a daily basis, yet take to the drag strip and dominate. It’s still that way today. All of the hype surrounding the new Challenger Hellcat has me thinking how the old Challenger stacks up against the new Challenger. Here goes. The most astute Mopar fans among us will likely call the Hellcat a cheater against the 1970 Challenger R/T. Yes, Dodge is using a big supercharger to squeeze 707 yowling ponies out of the Hellcat’s 6.2-liter V-8, while they used natural aspiration in the 1970 R/T. I think for a fair comparison, the Challenger SRT8 is a good car to compare it to. It’s got a 485-horsepower 6.4-liter V-8 (392 cubic inches), the option of an 8-speed automatic or a standard six-speed manual, and lots of performance goodies. Why include the Hellcat? Because right now, it represents the pinnacle of the Challenger line. Let’s go back 44 years to when the Challenger was new. 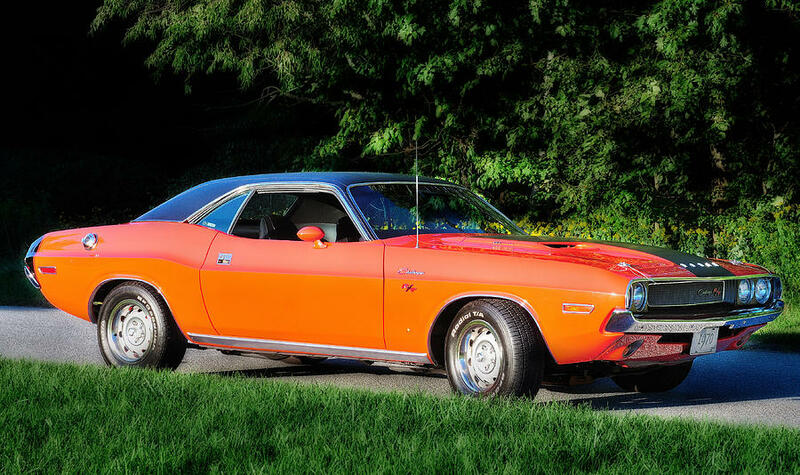 In 1970, you could walk into any Dodge dealership, and special-order a Challenger R/T with the 426 c.i. HEMI V-8 engine. To do so, you had to start with a Challenger R/T. This set you back $3,266. The E74 426 HEMI was an additional $778.75. However, checking the option box for the Elephant Motor meant you had to get the A34 Super Track Pak (4.10:1 rear end ratio, a 9-3/4 Dana rear end, a Sure-Grip differential, a seven-blade Torque Drive fan [essentially a serpentine belt-driven fan], a high performance radiator with a fan shroud, and power four-wheel disc brakes) for $236.65, a four-speed manual transmission (the A727 Torqueflite transmission was available for a higher cost) for $194.85, and a collapsible spare tire for $12.95. And that’s before add-ons. This bare-bones Challenger would have set you back $4,488.20, about the same price as a Corvette with the L-88 Tri-Power (427 cubic-inch solid-lifter V-8). That’s the equivalent of $27,559.63 in today’s money. The car would have weighed 3,402 pounds as optioned above. Add on air conditioning, an automatic transmission, and other such luxuries, and you’d be looking at about 3,600 pounds. Performance-wise, you were hard-pressed to find something faster than the Challenger R/T. It could get up to 60 mph in under 6 seconds (the Subaru WRX does it in 5.5), and rumble through the quarter mile in about 14 seconds at 104 mph. And that was before you slapped a pair of drag slicks on. I wasn’t able to find any information on how well it gripped, but quite frankly, those interested in going around corners in a Challenger would have picked up a Challenger T/A. Fuel economy? Let’s be honest here – if you don’t have a heavy right foot, are good at short shifting, you would be lucky to eke out double digits. This isn’t made for beating a Prius in fuel economy. Warranty-wise, the Challenger R/T came with a 12-month, 12,000 mile powertrain warranty good for the original owner only, instead of the standard five-year, 50,000 mile powertrain warranty. Let’s go back to the present. $40,485 is the minimum price of admission for any Challenger carrying the SRT badge. The weight has ballooned 800 pounds (mostly safety equipment and electronics) to 4,231 pounds. Horsepower has gone up to 470, but torque has dropped from 490 lb-ft to 470 lb-ft. When accelerating, the big Challenger will thunder to 60 mph in about 4.9 seconds, on its way to a very-respectable 13-second quarter mile on it’s sticky Pirelli P Zero tires. Despite all of these impressive numbers, the Challenger will return 23 mpg on the highway. What about the Hellcat? By January or February, you can walk into any SRT-approved Dodge dealer, plunk down $60,500, and say, “I’d like a Challenger Hellcat, please.” Just remember, that’s before price gouging and options. The Hellcat is heavier than the naturally-aspirated Challenger, tipping the scales at a monstrous 4,488 pounds. But, it does come equipped with a 707-horsepower Hemi V-8. It will sound like nothing else on the road for 3.6 seconds as you get to 60 mph, and then obliterate the quarter mile in 11.7 seconds at 126 mph on street tires. Slap on a pair of drag slicks, and you’ll see 10.80 seconds at about 137-14o mph. The massive supercharger requires 80 horsepower to keep it spinning, but it gives about 70 back when driving air into the engine. To keep things semi-sane on the street, the car is limited to just 500 horsepower (you can even drive it with 300 horsepower), unless a special “red key” is put into the ignition. To sum it all up, this may very well be the golden age of muscle car performance. It just depends on how you view it. Should I happen to be blindfolded and have to point at either a 1970 Challenger R/T, an SRT8 Challenger, or the Hellcat, I’d hope that I pointed at the Challenger R/T. That’s not to say I’d be unhappy with the Hellcat or the SRT8 – I’d rather just have the 1970 Challenger R/T. It’s not stupendously quick, safe, or conspicuous. But, that’s why people buy them. It’s just something that you will get thumbs up in everywhere. THIS is HEMI Orange. This is the car that I dream about. This is the car that I will own before I die. This is a legend. What’s that modification work? The chrome bumper around the grille and headlights, a black roof, and some mag wheels. This is under the radar…until you hear it! I heard one at speed recently, and there’s no real way to describe it. It’s just the loudest thing I’ve ever heard. If you want it to be louder, get a set of Cherry Bomb mufflers – they’re smog-legal, and they make more noise than anything this side of a Bonneville landspeed racer. Fiat Chrysler Automobiles is currently in the process of announcing a new five-year plan that will see many of the vehicles currently in the Fiat/Chrysler/Dodge/Jeep/Ram/SRT either discontinued or overhauled between now and 2018. Some brands will also be integrated, with SRT (Street and Racing Technology) being integrated into Dodge, just like it was before 2005. Dodge will become the performance brand, just like it was in the 1960’s, 1970’s, and 1980’s. This repositioning will mean that the SRT Viper will once again become the Dodge Viper (I never did get used to saying Dodge Viper)! Various SRT models outside of Dodge like the Chrysler 300 SRT8 and Jeep Grand Cherokee SRT8 will be discontinued by the end of the 2015 calendar year. If you want either of those two cars, get them NOW. Current Dodge CEO Tim Kuniskis will be in charge of the integration, while current SRT boss Ralph Gilles will still oversee Chrysler/Dodge/Jeep design and Dodge motorsports. Fiat Chrysler Automobiles CEO Sergio Marchionne said of Gilles, “I want to thank Ralph for his dedication to the SRT brand. Under Ralph’s leadership, the SRT brand expanded its vehicle lineup to include more highly customized models and received numerous automotive awards and distinctions.” That’s all completely true. Ralph Gilles has worked like an animal to transform the SRT brand into something that can compete with the likes of AMG, M, and Porsche. Dodge will lose its place as Fiat Chrysler Automobiles’ mainstream brand. Instead, Chrysler will take over that place, just like it was in the 1960’s, 1970’s, 1980’s, and 1990’s. Dodge will be repositioned as a sporty brand stuffed to the brim with musclecars, sporty crossovers, and the Viper. 2015: Dodge Grand Caravan and Dodge Avenger will be phased out. Buy the Grand Caravan NOW if you want one! The Dodge Challenger, Charger, and Viper will all receive updates. The Charger and Challenger will receive a supercharger (it is still unclear on whether the 6.4-liter Hemi V8 will be the engine with the supercharger, or possibly a 6.2-liter Hemi V8 codenamed the Hellcat). The Dodge Durango will not receive any updates (it received one in the end of 2013. 2016: The Dodge Dart will receive a mid-cycle update, and it will receive an SRT-tuned version with AWD, a high-output turbocharged engine, and hopefully a manual transmission. I think that we’re all thinking autocross and rally, right? 2017: The Dodge Journey, the bland crossover infringing on the Grand Caravan’s turf, will receive an SRT variant with AWD and a turbocharged engine. I like that idea. 2018: New compact Fiat-based hatchback to be launched alongside new versions of Charger and Challenger. That’s the next few years for Fiat/Chrysler/Dodge/Jeep/Ram/SRT. Except, it will be Fiat/Chrysler/Dodge/Jeep/Ram. Oh, Jeep is also bringing back the historic Jeep Grand Wagoneer name sometime in the next four years! I’ve always loved the look of the Grand Wagoneer, but a modern one gets me pumped up all over again! While some modern companies do convert Grand Cherokees into Grand Wagoneers, it’s just not the same. I’m signing off for the week. Have a happy 4th of July, everybody! See you then! 254-MPH Callaway Sledgehammer Chevrolet Corvette for Sale! For those of you who remember the cars of the 1980s, you’ll know that many of those cars didn’t have much more than 200 horsepower. Fox-Body Ford Mustangs had 225 horsepower, tops. Chevrolet Corvettes didn’t have much more. Buick Grand Nationals didn’t even top 275 horsepower. Nissan 300ZX’s barely made 200 horsepower. Then, Callaway came along with an 898-horsepower 1988 Corvette that went 254 mph. They called it the Sledgehammer. It gave hope to us automotive enthusiasts at the time that horsepower wasn’t a thing of the past. Sure, it wasn’t a factory vehicle, but who cares when you’re driving a Chevrolet Corvette at 254 mph? By the time you will read this, the Sledgehammer Vette will have a new owner, as it’s crossing the block at the 2014 Dana Mecum Kissimee, Florida, auction. John Lingenfelter (the same guy who would later start Lingenfelter Performance Engineering drove the car to 254.76 mph. This was done on October 26, 1988 at the Transportation Research Center in Ohio. This was done after the car was driven – not trailered – driven! from Connecticut. Power comes from a Chevrolet small-block V8 with aluminum Brodix heads, and a custom cam that targeted the sweet spot between heavy breathing and docile city driving. This is the kind of car where you can drive it to a standing mile event, set records, and drive it home. Since all Callaway cars are turbocharged, the Sledgehammer was no exception. It has a TO4B Turbonetics twin turbocharger kit with twin intercoolers. The engine wasn’t the only place to receive modifications. For high-speed stability (remember, very few race cars had hit 250 mph, and only a couple of partially-stock cars had ever been above 250 mph before this point), Callaway consulted with legendary race-car builder Carroll Smith. Smith relocated the Sledgehammer’s lower control arms to reduce ride height by one inch (a lower center of gravity is the best at high speeds) and added Koni shock absorbers. Goodyear ultra-high-speed tires were paired with 17-inch Dymag aluminum wheels. Callaway wanted the world to know that this was one special Corvette. The body is a special Callaway Aerobody. It looks pretty stock, but it has an elongated shovel nose and a high rump. Inside, it looks relatively stock, until one sees the leather-padded roll bar (every Corvette has to have some sort of luxury…), the five-point harness, and the various gauges for monitoring engine vitals. As if that didn’t make it even more special, it’s esteem has been significantly raised because Bloomington Gold folks chose the Sledgehammer as one of the 50 Corvettes that have significantly influenced the Corvette phenomenon. Bloomington Gold doesn’t invite your neighbor Bob with his Corvette convertible to be part of the Bloomington Gold Great Hall. It’s a very special car that is meant to be driven – hard! The Sledgehammer would be perfectly at home at a superspeedway like Talladega International Superspeedway. Congratulations to whomever owns a piece of Corvette history. Finally A Set of New Tires for the Porsche Carrera GT! If you are a Porsche Carrera GT owner, you MUST take me for a spin in it! If you are a Porsche Carrera GT owner, you a probably familiar with the words “OH NO!,” followed by some expletives, as your priceless supercar goes into a spin. If you are a Porsche Carrera GT owner, you probably cannot wait to buy the new 918 Spyder coming on sale on September 18. Now, I will give you some history on the Porsche Carrera GT. Way, way back in 1998, the FIA rules changed, outlawing certain designs that the factory-backed racing teams were designing. Porsche’s new design was originally intended to race at Le Mans in 1999, but the rules were changed. Porsche, understandably, was livid. The car was packed with technology – they had a twin-turbocharged flat-six borrowed from the 911, but decided it wasn’t powerful enough. So, they took the 5.5L V10 from a scrapped 1992 project, and pushed the planned competition season back to 2000. The V10 needed more power. So, they bored and stroked it out to 5.7 liters. After just two days of testing, Porsche cancelled the project. Mainly due to interest in the Cayenne SUV that was to be co-developed with Volkswagen, Porsche cancelled the program, due to the need of engineering expertise in the motorsports program. Porsche did keep the project alive, but barely. They took the 5.5L V10 and shoved it into a concept car that was shown at the 2000 Paris Motor Show, but it was intended to be used as a display to attract people to their stand. Interest and a surprising influx of revenue allowed Porsche to make the decision to build the car. Development was started on a road-legal version that would be produced in small numbers at the new Leipzig, Germany plant. Production was started in January, 2004. The cost: $448,000 USD. When production ended in May, 2006, 1,270 cars had been produced. What I want to talk about is the new tires that Porsche has developed for the car. Porsche and Michelin developed a tire with NO on it. The tire will be used on the new 918 hypercar, as well as being a replacement for the Pirellis currently on many Carrera GT’s. The NO refers to the new tread compound, which promises higher stability at top speed, better lateral grip, and a longer life. Even while being thrashed at the track, tire life will be extended by up to 20%, and on the road, up to 10%. I’m assuming that also refers to your life, as well! Justin Bell, a revered race car driver, said that driving a Carrera GT at top speed will turn a 40-year-old into a 75-year-old. It’s that scary at speed! Is This the World’s Fastest Riding Lawn Mower? I’m sorry for the delay. Editors can be finicky. The editor apologizes for her tardiness in getting you this article. But, this article is worthy of being late. Many of us know that Honda makes some pretty nice motorized gardening equipment. But, for Honda UK, a riding mower with a top speed of 8 mph simply wasn’t fast enough. This mean mower makes 109 horsepower at the wheels, which gives it an estimated top speed of 133 mph. That will certainly allow you a lot more time to do other chores. The mower reportedly gets to 60 mph in 4 seconds. Of course, Honda UK needed help to build this monster machine. Honda UK’s British Touring Car Championship partner, Team Dynamics, the stock 2013 Honda HF2620 Lawn Tractor was re-engineered and redone in every mechanical way possible. The chassis was custom-built to take the stresses of zooming around at speeds over 100 mph and mowing at 15 mph. The engine is a 109-horsepower, 1000 CC engine that was pulled from a 2013 Honda VTR Firestorm motorcycle. The suspension and tires were pulled from a Honda ATV. The seats are custom-built Cobra Racing seats, a Scorpion exhaust system, and a steering rack was pulled from a wrecked Morris Minor (a 1960’s British economy car). Tipping the scales at a relatively light 308 pounds, the surge of power is sent to the rear wheels via a custom-made six-speed automatic that features paddle shifters. Even though it has a lot of cool modifications, the mower can still mow – kind of. Thanks to two electric motors on the cutter deck, the steel cutting cable will spin around at 4000 rpm. Earplugs are advised. So is a helmet. I’m not sure of where the grass will go – the fuel tank is inside of the grass bag. While it can reach an estimated top speed of 133 mph, mowing can only happen at speeds up to 15 mph (twice the speed of the stock unit!). All in all, the mower is an interesting mix of Honda, British economy car, and custom racing components. It’s simply diabolical. I want it. Make that, need it! Pagani is preparing to wind down production of their wild Zonda supercar. They recently unveiled a final Zonda edition: The 2013 Pagani Zonda Revolucion is the most powerful Pagani ever built. It puts down 800 horsepower to the wheels, so speed is of no matter in a car that weighs 2400 pounds. The Zonda Revolucion is an evolved Zonda R, and it is powered by a 6.0-liter Mercedes-Benz V12. Fuel economy obviously isn’t on the top of Pagani’s radar. To slow down the car, Pagani upgraded the brakes on the Zonda Revolucion to the latest version of their CCMR carbon-ceramic brakes. It is said that the brake system is 15% lighter, yet better than ever at dissipating heat during track use. Another quite new piece of technology is the F1-inspired Drag Reduction System rear wing that can automatically adjust downforce produced depending on the car’s speed. Plus, the driver can manually override the wing setting by pushing a small button on the steering wheel (the only button on the steering wheel other than the horn!). As for visual enhancements, the Pagani Zonda Revolucion looks like it came directly out of a Batman movie. It’s matte black, with a red stripe down the center with white and yellow borders. It also has yellow wheel lips and white, red, and yellow stripes on the sides of the car. The 2013 Pagani Zonda Revolucion will NOT be offered in the U.S., but it costs the equivalent of $2.8 million before taxes set in. Will it be the last of the Zondas? Pagani says that the Zonda’s production will stop so Pagani can focus on the Huayra hypercar. Yet, here we are talking about a new Zonda model! The picture should explain it all. Nothing else should be said.